A Dhow Cruise is a highlight for many visitors to Dubai. Dubai today is virtually unrecognisable from the sleepy fishing village that it was just 200 years ago. The oil boom of the 1960s led to astronomical levels of investment and development, which put the city firmly on both the business and tourism map in just 50 years. While the global business centres, ultra-luxurious hotels and fine beaches are certainly at the forefront of Dubai's global image, the city's proud history as a busy port has not been lost entirely. In fact, a traditional dhow cruise in Dubai is a highlight for many visitors and is an excellent way of bridging old-world Dubai with its modern-day incarnation. What is a dhow cruise? Dhows have been plying the waters off the Arabian Peninsula for hundreds of years, carrying all manner of goods through the Persian Gulf to India, East Africa and beyond. In fact, Dubai almost certainly owes much of its current prowess to the humble sailing vessels which first brought valuable trade to the city’s shores. These days, however, the majority of the world’s ocean cargo travels by container vessel, meaning that dhow captains have turned to tourism as an extra source of revenue. Nowadays, a number of operators offer dhow cruises with dinner in Dubai, meaning you will be spoiled for choice and should be able to secure an excellent dhow cruise deal at any time of year. Dubai Creek Cruise or Dubai Marina Dhow Cruise? Both daytime and dinner cruises tend to focus on one of two parts of Dubai, namely the more traditional Dubai Creek area, or the ultra-modern Marina. While both will offer incredible views of the city, which option you choose will depend entirely on what you want from your experience. 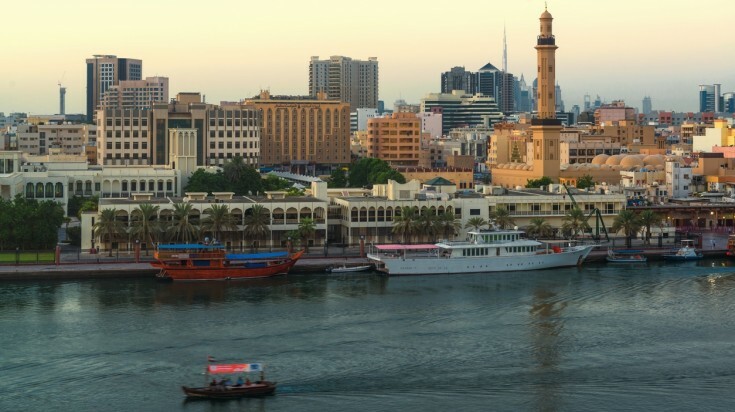 A Dubai Creek Cruise passes through the historic heart of Dubai. Those seeking the full Lawrence-of-Arabia experience of sailing a wooden ship through quiet canals, flanked by sandstone buildings should opt for a tour of the Creek area at the historic heart of the city. While arguably less dramatic or exciting than other parts of the city, the Creek is an often-underrated destination and makes a great backdrop to a romantic night on the water. 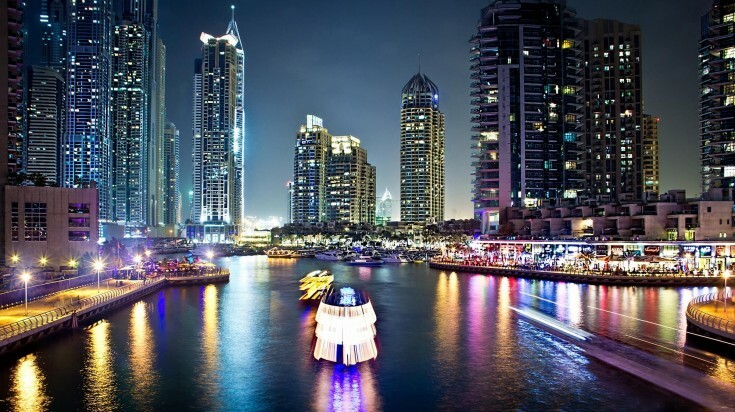 A dhow cruise through Dubai Marina offers views of skyscrapers, bright lights and all the glam. On the other hand, if you’ve come for skyscrapers, bright lights and all the glitz and glam that goes with Dubai, the Marina — Dubai’s throbbing modern heart — will be sure to delight the senses. The atmosphere can be intoxicating as you cruise past 5-star hotels, world-famous restaurants and the super-yachts of the rich and famous. While not exactly a ‘traditional’ experience, the views are world-class! What to expect on a Dhow cruise in Dubai? During the day, boats operate sightseeing tours in and around Dubai Creek and the marina, offering stunning views of the city's incredible skyline and sending cool sea breeze through your hair. The Burj Khalifa dominates the city skyline while the waterfront Burj al-Arab and Atlantis Hotels become even more spectacular when viewed from the water. A dhow cruise tour covers most of Dubai's highlights, thus it is one of the best things to do in Dubai. 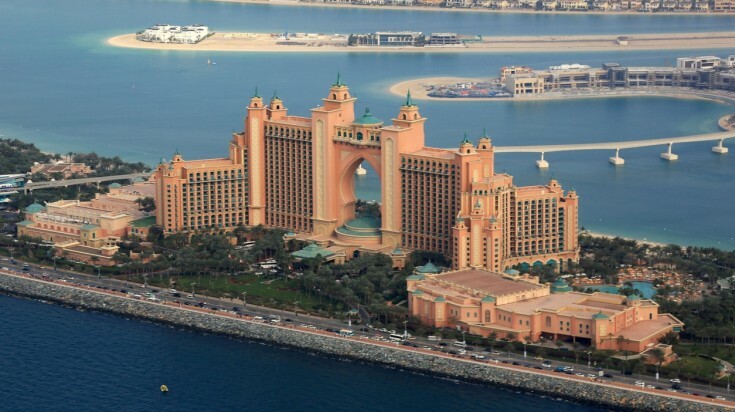 The Atlantis Hotel can also be viewed from a dhow cruise. Take an evening dhow cruise in Dubai Marina and view the Dubai skyline along with Burj Khalifa, the tallest building in the world. Come sunset, the focus shifts to dhow cruises with dinner, with many operators offering fully-immersive packages including traditional music and Tanura dance performances, a hearty buffet of Arabic delicacies and, of course, the chance to savour that magical skyline at night! 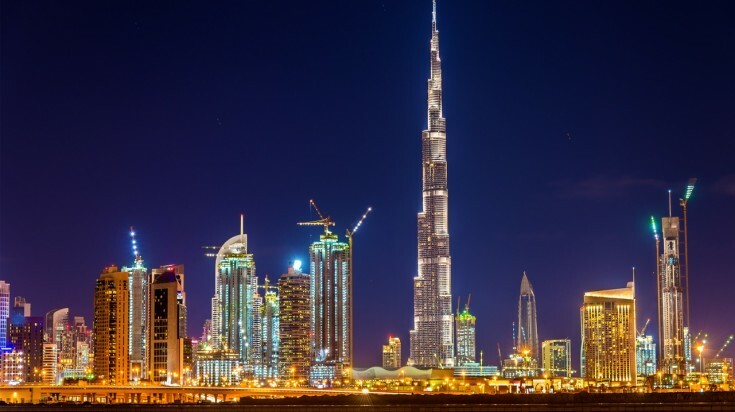 There's something magical about any city's skyline at night, but couple this with the warm desert air and the gentle hum of traditional Arabic music and a Dubai dinner cruise is an experience unlike any other. When searching for dhow cruise deals in Dubai, it's worth comparing what is included in the price, as this can vary significantly between providers. For example, some operators will offer hotels pickups and drop-offs as part of the package, while others will charge extra or expect you to make your own way to the embarkation point. If booking a Dubai cruise dinner, be sure to check what will be on offer, as options range from simple buffets to luxurious fine-dining experiences. By the same token, some cruises include drinks while others will charge extra once on board — not necessarily a problem, but best to check in advance to avoid any unwanted surprises! Dubai’s popularity amongst foreign tourists is largely thanks to its year-round sunshine, meaning there is no ‘bad’ time to visit the city. And, fittingly, dhow cruise deals are available all year round. That said, November through April is considered the city’s high season where temperatures are more bearable although prices tend to be higher. Bargain hunters would do best to visit during the low season between June and August, where a number of dhow cruise tours will be available for cheaper. Be warned though, temperatures frequently rise to about 40°C during the day, meaning a sunset cruise is highly advisable to avoid the worst of the heat! Regardless of your choice of location, you will find that operators offer both daytime and evening cruises, with many offering departures timed to coincide with the spectacular Arabian sunsets for which Dubai is famed. While daytime cruises offer the best views of the city, sunset departures provide an unforgettable experience along with the chance to see the skyline illuminated at night — in many ways offering the best of both options! Taking a dhow dinner cruise in Dubai is another popular pastime, with both romantic and more lively options available. Given the year-round heat and intense sunshine, packing and using suitable protection from the sun is essential. High-factor sunblock, a hat and sunglasses are essential. A loose-fitting shirt to cover your shoulders will also come in handy if you are exposed to the sun for an extended period. Most dhows offer an air-conditioned cabin which can provide welcome relief from the heat, as well as drinking water and a selection of other drinks. Check with your operator upon booking whether water is included in the price quoted, or whether you are able to bring your own on board with you. 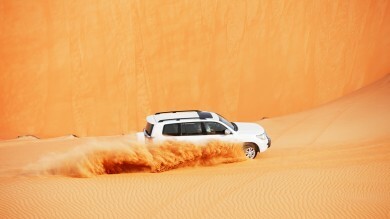 Most dhow cruises offer hotel pick up and drop off. Contact your tour operator regarding this when booking a dhow cruise tour. 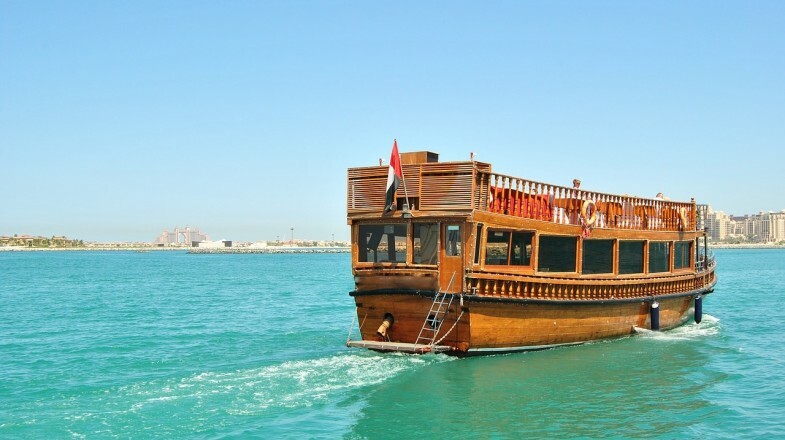 A mix of history and modernity is what defines a dhow cruise in Dubai. While a dhow boat was once the ultimate means for goods transportation, today it is a great way to explore Dubai and skyscrapers, coasts and waterways.